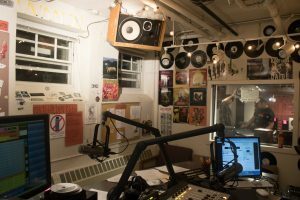 WMCN airs over 70 student-run radio shows throughout the week. 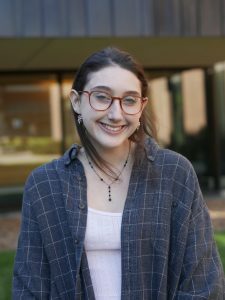 I talked to Allegra Berman ’21 and Vivian Bauer ’21 about their show, “Across the Universe with Allegra and Viv,” which they started last semester. TMW: What can a listener expect when they tune into your show? AB: Each week we pick a city, state, country or region somewhere outside the United States and play their music. Last week we played Mexican music. TMW: What was the inspiration for the show? AB: We came up with the idea last year when Vivian had me on her show. We were about to go on a trip together, so we thought it would be fun to “travel” on the radio. It’s a good way to get out of Minnesota for the week. VB: We just had a general interest in learning about international music. We like to do fun bits where we pretend to see buildings or monuments from the actual place. TMW: What’s the research process like for selecting music? VB: Last week we only knew of one artist in Mexico, so we just started with her and found music through her. I’ll go online and ask people about music, or, often times, I’ve asked my linguistics professor, who knows a lot about international music. Spotify is a great resource. AB: We try to reach out to people in the community who might have some kind of ties to the music. TMW: How has your show changed since it began? VB: We’ve been challenging ourselves to go out of the United States. We did most of the United Kingdom, and we’re going to Italy. The places we did last semester that weren’t in the United States we knew more about, so now we’re trying to pick places we don’t know. AB: Some of our episodes have been more thematic than others. We did an episode that was about Detroit, but it turned into mostly Motown. Last semester we did an episode where we went to outer space because we had a guest who wanted to do that. We also spent three or four weeks covering Wales, Liverpool and Scotland. TMW: What do you guys get out of doing your show? VB: It’s a good two hours for Allegra and I to not think about school and the Mac bubble. We talk about music and go somewhere else. AB: It’s also a really nice time to hang out despite our really busy schedules. TMW: What’s your latest music obsession? VB: I’ve been listening to a lot of Brazilian artists lately, specifically this one artist I found who’s only on YouTube and other artists in the female vocalist singer-songwriter genre. AB: I’ve been listening to The Cranberries, like non-stop. The acoustic version of The Cranberries.